Office 2011: Should you upgrade? Outlook for Mac 2011 is a new e-mail client and personal information manager from Microsoft, not just an upgrade to its predecessor, Entourage 2008 ( ). Outlook 2011 has some features that Entourage had, but if you approach Outlook 2011 expecting it to be an upgraded Entourge, you’re going to be frustrated. As someone who is, by any measure of the term, an Entourage power user, I found that once I stopped thinking about Outlook as “Entourage 2011,” my experience with the new software quickly became much easier. Outlook 2011’s Mailing List Manager, Scheduling Manager, and Rules implementation are mostly unchanged from Entourage. Otherwise, Outlook 2011 is all new. Anyone used to modern versions of Outlook on the PC, or for anyone on a Mac who needs to talk to Exchange, will find that Outlook 2011 will be kinder to you than Entourage ever was—as long as you're using Exchange Server 2007 or later. Outlook 2011 does not support the older HTTP-DAV connection method that Entourage used. Outlook 2011 is a Cocoa application; it doesn’t have a legacy of over 20-plus years on the Mac and doesn’t have the kind of code base that the other Office programs have. Moving forward, the Outlook development team will have an easier time than the other Office development teams with operating system compatibility. 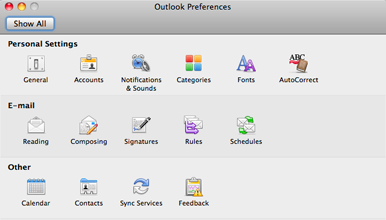 Unlike the rest of the Office 2011 suite, Outlook 2011 supports Mac OS Services (so did Entourage), and you get some of the basic niceties that Cocoa has. Though I did no benchmark testing, Outlook 2011 feels faster than Entourage. Outlook 2011 launches minutes faster for me on the first launch of the day after a shutdown. Some of the user interface (UI) lags in Entourage while checking mail or doing other tasks never appeared or were far less annoying than in Entourage. Cocoa magic aside, drag and drop in Carbon applications always works more intuitively. As a result, Outlook 2011 takes a step back when it comes to drag and drop. You don’t have to do the click-and-hold delay when dragging text, and dragging an attachment into a background Entourage mail window is a far simpler experience than doing so with Outlook 2011, where I had to bring the message window to the foreground and then drag the file from a Finder window in the background to the message window. I’ve seen the same behavior in other Cocoa applications—Cocoa just doesn’t do drag and drop as well as Carbon. I tested Outlook 2011 in the same configuration that I use Entourage on a daily basis: six IMAP accounts total, with three accounts using SSL for both send and receive, two Gmail accounts, and one Exchange 2007 Exchange Web Services (EWS) account. Back-end servers run the gamut from MobileMe, Kerio, and Communigate Pro to Exchange 2007. I have over 70 IMAP rules, a handful of SMTP and Exchange rules, and too many Mailing List Manager rules to count. I also have an Exchange Calendar with gobs of public folders (I live by my to-do lists), and I have three separate Directory Service accounts that I use as part of my work. Entourage's database was a big file that changed constantly, which made for painful backups. The big news in Outlook 2011 is that there is a new way of dealing with Outlook items, and each item is stored as an individual file or files—however, there’s still a database. Database: Outlook 2011 still uses a database, but Microsoft re-engineered the program so that the database isn't essential to storing data. According to the Outlook development team, the database is there purely to optimize search and other non-essential routines. So what would happen if I deleted the database? After quitting Outlook 2011 and the Database Daemon process, I deleted the database file and restarted Outlook 2011. The program popped a message saying that since I had restored from Time Machine, (amusingly, this message is hardcoded into Outlook 2011 based on the assumption that the only time you’re going to have all the individual files and no database is after a Time Machine restore), it was going to rebuild the database, which it did. The database is not only non-critical, it's much smaller; in my case, my Entourage Database is under 5.5GB, and my Outlook 2011 database is over 500MB. Not a bad reduction, and you can ignore it completely for backups. Time Machine support is a mixed bag. Because everything is in individual files, once you’ve done your initial backup, then any changes only require backing up those changes, (just make sure you exclude the Outlook 2011 database from Time Machine.) However, there’s no actual Time Machine integration, a la Apple Mail ( ). And due to the requirements of Spotlight and others, the deeper folder structure is incomprehensible. For example, to get to my signatures, the folder path is /Volumes/jwelch/Documents/Microsoft User Data/Office 2011 Identities/Main Identity/Data Records/Signatures/0T/0B/0M/0K/—not the things easy selective restores are made of. The Outlook development team acknowledged that doing a partial restore, such as a single message or a single contact, would be quite tedious. In this release of Outlook, the restore is all or nothing, but a lot better than the state of Time Machine with Entourage. For anyone in a business or educational setting, where you’re using Portable Home Directory (PHD) sync, I noticed no problems with PHD sync at all. In a quick comparison, the synchronization works as it does for Apple Mail as long as you exclude the Outlook 2011 database. Bringing in data from Entourage was a snap. Accounts, rules, signatures, e-mail, events, contacts, categories, and so forth, all imported without a problem on the first try. Importing from other programs was similarly pain-free. I also tried dragging a few thousand messages that existed only as .eml files into a folder in Outlook 2011; it took a while, but they all imported correctly. The only caveat about importing is that if the Entourage Database Daemon is not running, the Entourage import may fail. I did not test .pst file imports. I’m pleased to say that IMAP/SMTP accounts worked correctly in my testing. Outlook 2011 handled both SSL and non-SSL accounts with ease, and HTML and plain text e-mails worked fine. Account setup is similar to the way it was in Entourage, except that the account settings have been merged into an all-new application preferences dialog box. The only glitch I noticed is that when you tell Outlook 2011 to use SSL with your SMTP account, it leaves the port at 25, instead of changing it to 465—minor, but annoying. If you have an account with a mail provider Outlook 2011 knows about (like MobileMe), then the software does a good job of automatically setting up the account details. Preferences: Outlook 2011's account settings are now found in a new Preferences dialog box. One feature that's still missing is support for Kerberos as an authentication mechanism for IMAP/SMTP accounts. It’s available for Exchange, but the lack of Kerberos support means that you can’t use Single Signon for IMAP in Outlook 2011 as you can with Mail. Another quibble is that the default compose setting can’t be set per account, so you can’t have one account that defaults to HTML and another that defaults to plain text. It’s a power feature and the Outlook development team said that it wasn't able to add it to the initial release. Other power features that are missing are the ability to add custom headers to e-mail messages, and the option to view the full headers of a message. 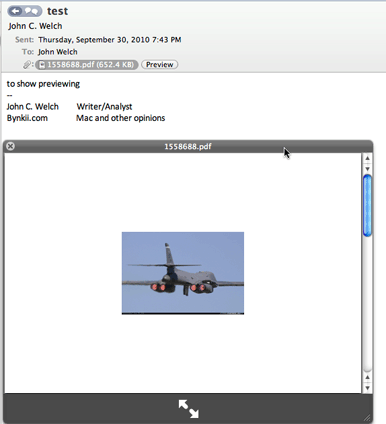 For attachments, Outlook 2011 can use Mac OS X’s Quick Look function to easily preview the attachment contents. While Outlook 2011 does have an updated junk mail filter, it’s still the same kind of filter as that in Entourage. It also seems to be unclear on the concept of “If someone is in my address book, then their messages aren’t junk”—I got inconsistent results. Preview: You can use OS X's Quick Look to see an e-mail attachment. The ability to reply to a message as a meeting is handy, although unless you’re running Exchange, you lose the ability to use the scheduling assistant to check availability. In my tests while running Exchange, this feature worked flawlessly. The UI for managing IMAP folders has changed quite a bit. 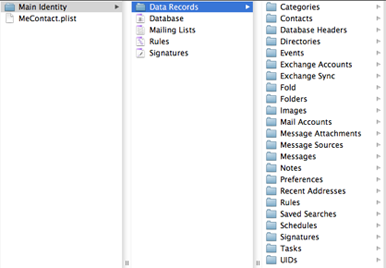 It’s actually part of the new Public Folders window, and this is where you now manage subscriptions to IMAP folders. Unfortunately, all you can do with this new UI is subscribe or unsubscribe to folders. There’s no way to get any of the properties of that folder, or share the folder (Outlook 2011 doesn’t support IMAP folder sharing), or even create a new folder here. You can create a new folder in the main mail view, but to have that option be only available for Exchange Public Folders in this window is frustrating, and hopefully this will change in a future update. Outlook 20011’s calendar contains some notable improvements on that in Entourage, such as better event displays, the ability to create multiple calendars (categories are still available), and more. If you have multiple calendars, then Outlook 2011 by default shows you a merged view for all calendars, local and Exchange. You can turn individual calendars on and off with ease. Categories are common across all calendars; there’s no way to have separate categories for each calendar. One thing Outlook 2011 does that iCal could take a cue from is that if you have a specific calendar selected, the events for all other calendars fade out a bit. It’s a small feature, but very helpful when trying to keep track your calendars. By default, all calendars have the same color; if you want events to have different colors, you have to assign a category. One trick Outlook 2011 could stand to learn from iCal is the ability to change the calendar for an event from within the event itself. Setting up events has changed a bit. There are now two different kinds of events: appointments and meetings. The difference? You invite people to meetings, not to appointments. This separation is a bit pedantic, since you can invite someone to an appointment, but when you do, it changes itself to a meeting. Do you really need two buttons for what is really the same UI? I’ll hazard that this is one of those “Outlook on Windows does this, so shall we” issues. It’s not evil, just tedious. As part of the Ribbon UI change (I’ll specifically address the Ribbon later), there’s some handy controls added to Outlook 2011’s calendar, such as dynamic resizing of your calendar view if you’re viewing your calendar as a grid, in Day, Work Week, or Week mode. There’s no resizing for month other than resizing the window. 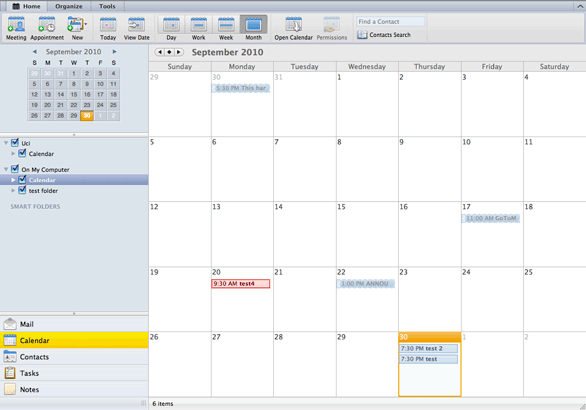 Calendar: Outlook 2011's calendar displays events recorded on your personal Outlook calendar, as well as events recorded to Exchange. Outlook 2011 has no CalDAV support. There are reasons for leaving it out of the first release (this version was heavily focused on Exchange), I hope future updates add CalDAV support—Outlook 2011 is entirely too useful to be solely bound to Exchange calendaring. You can use .ics files, but it’s not the same. There’s also no Sync Services support for Events, so you can’t have Outlook 2011 talk to iCal that way. The Outlook team stated this was due to the complications in syncing events in a transparent manner, and so rather than ship with the same kinds of problems that marred Entourage’s Sync Services implementation, they decided to wait until they could guarantee better results. Microsoft plans to add calendar sync support in a future update. Contact management stays much the same, with any changes in the UI being more for the benefit of Outlook/Exchange than anything else. If you’re using Outlook 2011 with LDAP directory services, you can’t browse those directories, but the search works well. One complaint here is that Outlook 2011 assumes all directories are Active Directory (AD). If you’re using, say, Apple’s Open Directory, some things don’t show up correctly. Data like supervisor/supervisee information don’t show up if you aren’t using Exchange/AD, and you get an incorrect error message for that screen that there’s no directory service available—there is a directory service, just not AD. Providing directory/LDAP mapping information would be helpful in allowing system administrators to work around some of these issues.